What are Suspicious Devices in Mobile Fraud? In the world of mobile fraud, Suspicious Devices are devices that have a significant, but not a 100% conclusive fraud profile. DeviceRank™ identifies these devices as suspicious using automated machine learning that analyzes over a dozen points of anonymized metadata across tens of thousands of apps and billions of mobile data points. Devices with a DeviceRank™ rating of B are designated as suspicious. 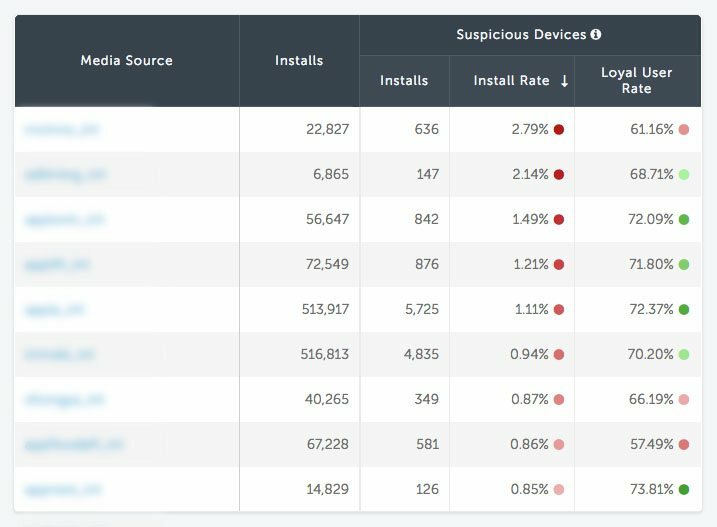 While clicks, installs and activity from these devices are not automatically blocked by AppsFlyer’s Protect360, marketers using Protect360 can easily track which media sources are sending large numbers or high concentrations of suspicious devices, and take timely corrective action.